Forget the partridge and the pear tree. Leave the calling birds behind. We’re celebrating the 12 Days of Christmas with the best holiday experience marketing from across the globe. Santa and his elves have gathered favorites from golden days of yore along with newfangled technology to help you deck the halls. Prepare to witness holiday marketing magic. There’s no place like home for the holidays, but it often takes a flight to get there. In Amsterdam’s Schiphol Airport, a circle of seats brought together an unlikely set of strangers for a joyous holiday feast. I’ll take a decaf peppermint mocha, hold the controversy. 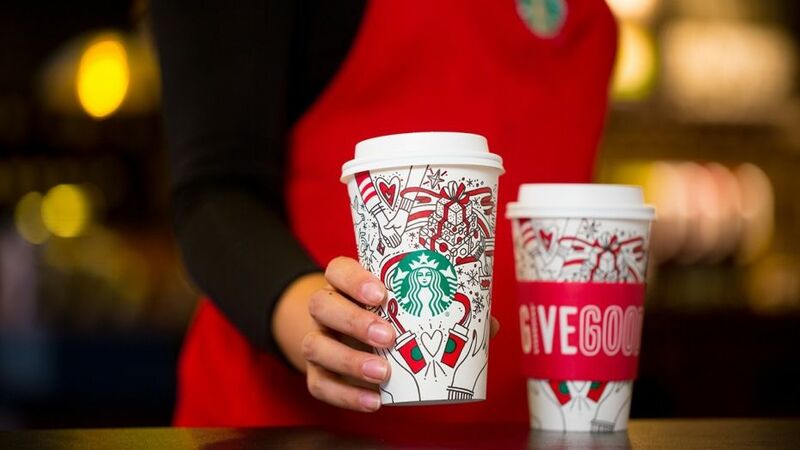 Starbucks has repeatedly drawn criticism for its choice of holiday cup. But this year, the coffee mega-brand decided to let customers do the drawing instead. Their 2017 design features a black and white sketch for customers to color in whatever way they fancy. A lifesize ping-pong table ornament? It’s almost as hard to believe as Santa making it around the world in one night. But Krazy Glue made it happen. Upon a 25-foot artificial tree in New York City, alongside other extra-heavy decorations (read: drum set and LED TV), the ping-pong table was hung using only a few drops of Krazy Glue. The Krazy Kristmas tree demonstrated the adhesive’s strength and highlighted the brand’s partnership with Big Brothers Big Sisters of New York City, to which all the “ornaments” were donated. 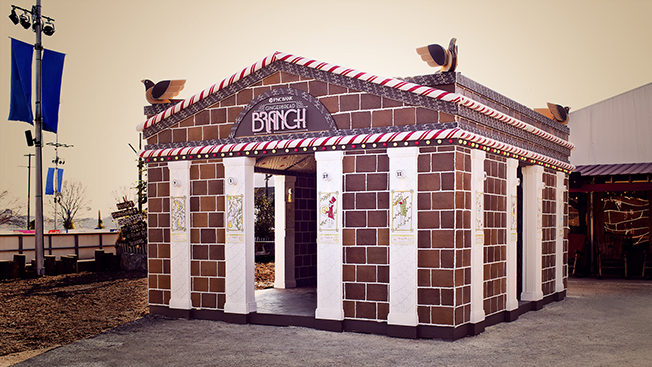 Keeping with the theme of oversized holiday symbols, take a look at this bank branch made of gingerbread. The structure celebrated the release of PNC’s Christmas Price Index, which prices out each gift in the song “12 Days of Christmas.” Visitors to Penn’s Landing in Philadelphia explored the 5,000-pound gingerbread bank, used the working ATM and even opened new accounts. WestJet has a history of spectacular Christmas stunts, but this activation from 2013 is sure to make your heart grow three sizes. Before takeoff in Toronto, WestJet passengers told Santa what they wanted most for Christmas. Airline elves (staff) moved swiftly to make 250 wishes come true. Let’s just say people have never been more excited to see the contents coming out of a luggage carousel. Grab a tissue and enjoy. Kids from one to 92 could hardly believe their eyes. Did that man in the mall’s ad screen really wave as they walked by? Curious shoppers gestured back to discover the ad wasn’t an ad at all, but a live video feed. When the man on-screen invited one inquisitive passerby to play a game of Pictionary, crowds gathered quickly. Through the interactive game, Mattel transformed a holiday shopping outing into a surprise day of play and prizes. Having a blue Christmas because a loved one couldn’t make it home? Surely a Coca-Cola ought to cheer you up. In 2016, Coke designed limited edition bottles that allowed consumers in Italy to record or play a message at the twist of a cap. A greeting from an old friend, a dinner table joke, or a holiday surprise – the beverage brand encouraged Italians to use their imagination to share a message in a bottle during the festive season. Combine augmented reality and a Beyonce lyric, and you’re pretty much destined for marketing success. IKEA has done just that this holiday season. Using IKEA Place technology, customers can use their smartphone to see how a Christmas tree looks in different parts of their home. It’s an extra-clever way to encourage experimentation with Place, which more traditionally enables users to visualize the placement of IKEA furnishings. The weather outside is frightful in Lowell, Michigan, but a display of civic generosity is sure to warm your heart. When pulling people over for minor traffic violations, police asked drivers about the status of their holiday shopping. Behind schedule or disappointed at not being able to afford the gift their children wanted, most drivers felt discouraged by the question. Lowell police to the rescue! Radioing the sought-after items to fellow staff and volunteers, the cops returned to each car window with the driver’s Christmas wish in hand, traffic ticket not included. Two things are to be expected during the holidays: 1) overindulgence and 2) competition among marketing agencies for the most creative Christmas card. At High Road Communications in Canada, the former informed the latter. 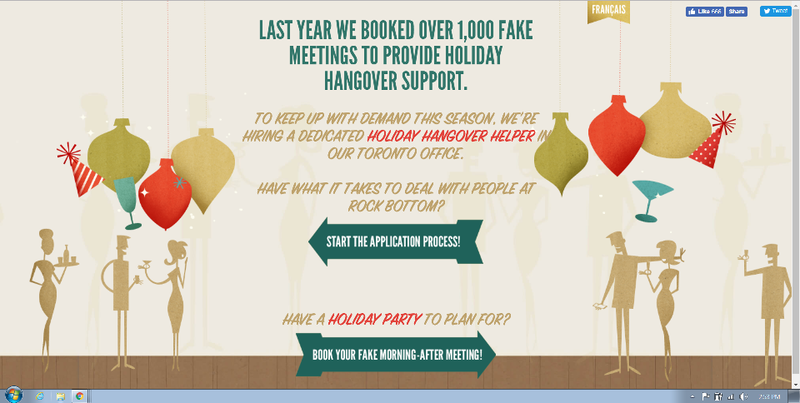 The agency’s Holiday Hangover Helper allows you to block your calendar with a fake morning-after meeting. Spare yourself that post-holiday party strategy session and book yours today. For TD Bank customers, Christmas came in July. The financial institution converted an in-branch ATM into an Automated Thanking Machine. The ATM caught customers off guard by uttering a verbal thank you. It then acknowledged personal details, such as how much one man loved the Toronto Blue Jays and how a mother was contributing to her daughter’s cancer treatment in Trinidad, and doling out thoughtful gifts in turn. The Automated Thanking Machine brought tears to many customers eyes, and is likely to bring them to yours as well. Okay, so this isn’t an experience in and of itself. But it beautifully demonstrates how Apple helps users create and capture special moments. The ad shows a disinterested teenager on the sidelines of a series of holiday activities. Despite efforts to engage him, his focus remains on his iPhone. The end of the ad brings a big surprise. The misunderstood boy hasn’t been ignoring his loved ones, but rather gathering footage and photos of them to make the best gift imaginable.